A wonderful gentleman came to our Dublin, OH custom jewelry store with a little project. He had this beautiful platinum diamond necklace, passed down through many generations, but it wasn’t behaving. Every time his wife tried to wear it, the end would flip up and it wound up looking like a hula hoop around her neck. He wanted something to anchor the necklace, but not be permanent. When Scott started looking at the construction of the vintage style necklace, he noticed that the diamonds were all different sizes and grades – they didn’t match at all! It turns out that this intricate piece of heirloom jewelry had a great story. It was made very quickly right before World War II. Our customer’s family decided that they needed to get out of Germany, and, at that time, those leaving were allowed to take with them ONE piece of jewelry per family. So, they gathered everything they owned and had a local jeweler craft a piece to hold all the stones while they fled. That explained the different sizes and why it didn’t really fit well – there was no time for adjustments! Scott didn’t want to alter it’s history, but both he and the customer wanted the new part to look like it always belonged. So they came up with a design using a gorgeous blue sapphire. Using our cool CAD (computer aided design) technology, Scott was able to copy the details on the original necklace, and used a hidden hook system to attach it to the piece. Now the weight of the sapphire pendant would make this necklace lie straight. 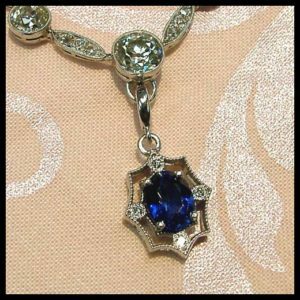 PLUS when she didn’t want a fancy look, she could wear the sapphire alone on a simply chain or even a black leather cord! We love versatility! Every piece of jewelry should have such a story! This is a fantastic story and a beautiful necklace. We are so lucky to have you in our Dublin community helping us to think out of the box about our heirloom jewelry. Scott’s is a great jeweler that we have used many times in the past. Great story. And as far as Scott coming up with this idea, the man is amazing!